I had a client last week ask me a question that I’m getting more often from clients – “should I be on Instagram?” The question came from a founder who is developing a platform targeted at college & university students to help them better organize their class schedules and build better study habits. She wanted to know if she should be on Instagram, and if so how she should use it. 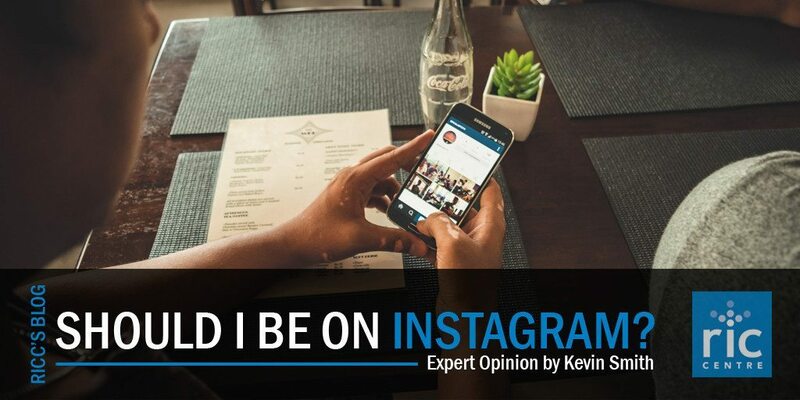 The answer to the question “should I be on Instagram?” has 4 main factors. Your audience, Your Brand, Your Objectives, and Your Resources. Let’s look at her scenario, and how these factors come into play. First is the question of audience. The key rule that I have is to be where your customers are. Instagram is the fastest growing social network, with over 300M daily users and the bulk of those customers are grouped in younger age demographics. 53% of people from the ages of 18 to 29 are Instagram users with more women than men. Over 50% of the people who use it have some college or at least a high school diploma. There’s a fair chance that my client’s potential customer base is going to be using Instagram. Factor 1 – Check. Does her brand fit well with the purpose and tone of the targeted social network? Instagram is a very visual network, where people are mostly engaging with people that they know, like, and follow with images and videos. Can she develop an authentic voice around her brand that won’t come across as “lame” or “spammy”? Is there something about her brand that is visually appealing or can be highlighted in a visual way? There’s a bit of a challenge here, since what she is promoting is software. It’s not a product that can be unboxed, and it’s not a unique food that people can show their friends. Her platform has to have exceptional visual design if it’s going to be engaged with and shared with potential customers. I think in her case she has to think very hard about how she gets across her brand story. Whether or not she can activate her brand depends on her objectives. Factor 2 – Unclear. What’s going to make this work for her is her desired end goal, and the visual story that she will end up telling through Instagram. Is she just going to try and drive brand awareness? Is she going to try and highlight her culture? Make people aware of events? Drive sales? I think if she picks the right goal, she can work authentically through Instagram. For example if she decided only to focus on showcasing their presence at campus events, she could build a theme that might get attention from her audience. I would recommend a campaign theme of “Study Better. Party Harder.” I would tell stories about how educational efficiency and success lets students get more out of the college experience, using images of the activities and events that students can take part in at campuses across America. Factor 3 – Check. The final question is, does she have the resources to be able to execute on a campaign like this? For her to execute effectively, she needs to have the time herself to go to various campuses and take photos that tell her story. Or, if possible she can, she can get users to share their own photos telling their own stories. Either way, a significant amount of her time would have to be spent on creating a viable presence on Instagram. In her case, it may make sense to bring on a specialist who can handle the development and execution of the campaign for her. It would make sense to start with 1 or 2 campuses, potentially hiring a student part time to be her Instagram manager, and acting as a campus brand ambassador to help tell her story. Another strategy might be to find the key campus influencers and partner with them to help tell her story. If she can get the popular kid to use her software, get better at school, and have more time for campus activities and be able to tell that story effectively through Instagram, she would have a very compelling social media strategy. Factor 4 – Check. In summary, I would recommend for her to run some experiments to test whether this strategy would work in her favour, and after a month or two at one campus, analyze the traffic and engagement to see if it’s resulting in greater awareness and greater use of the software at that campus. I would also have her run a more traditional campaign at another campus with on campus posters and Google Adwords to see if other campaigns would be more effective, to help her see where to put her money in the long run. What are your thoughts? Would you have her engage in Instagram? How would you go about it?